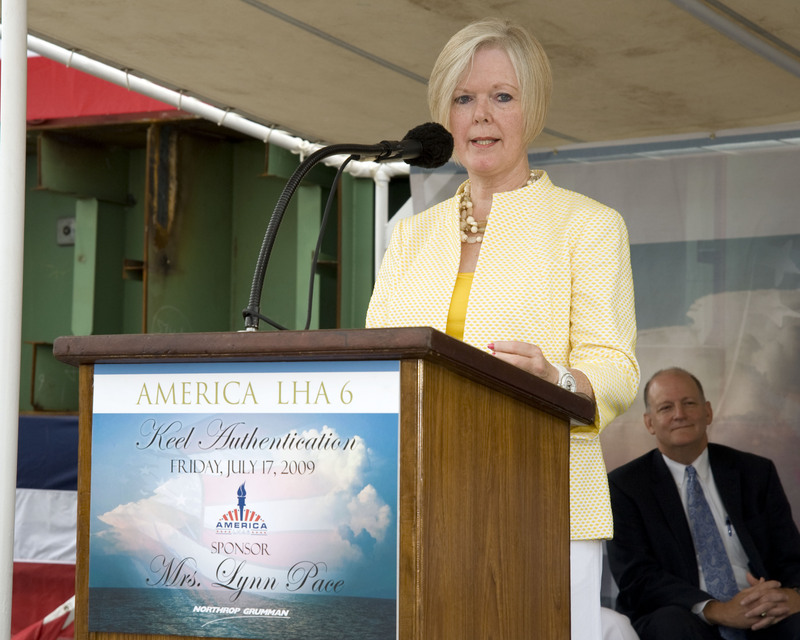 Laid down, 17 July 2009, at Ingalls Shipbuilding Corp. Pascagoula, MS.
701k America (LHA-6) Keel Authentication Ceremony, Mrs. Lynne Pace, sponsor of America (LHA-6). 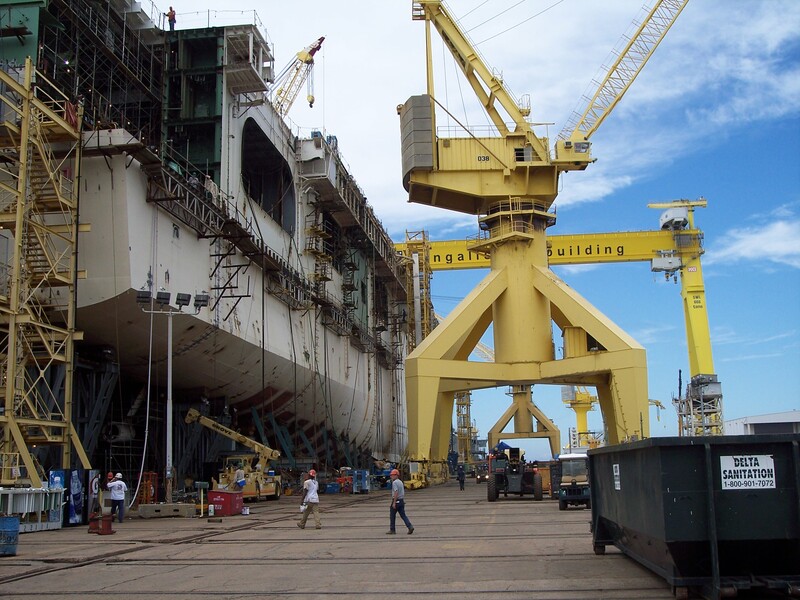 419k America (LHA-6) bow assembly at Northrop Grumman Ingalls Shipbuilding Corp. Pascagoula, MS.
416k America (LHA-6) at Northrop Grumman Ingalls Shipbuilding Corp. Pascagoula, MS., 20 September 2010. 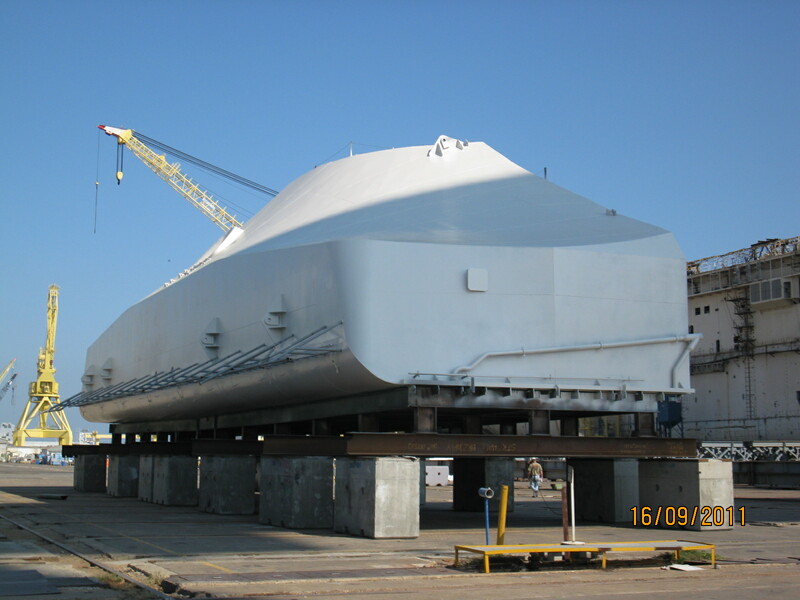 1364k America (LHA-6) at Northrop Grumman Ingalls Shipbuilding Corp. Pascagoula, MS., 22 September 2011. 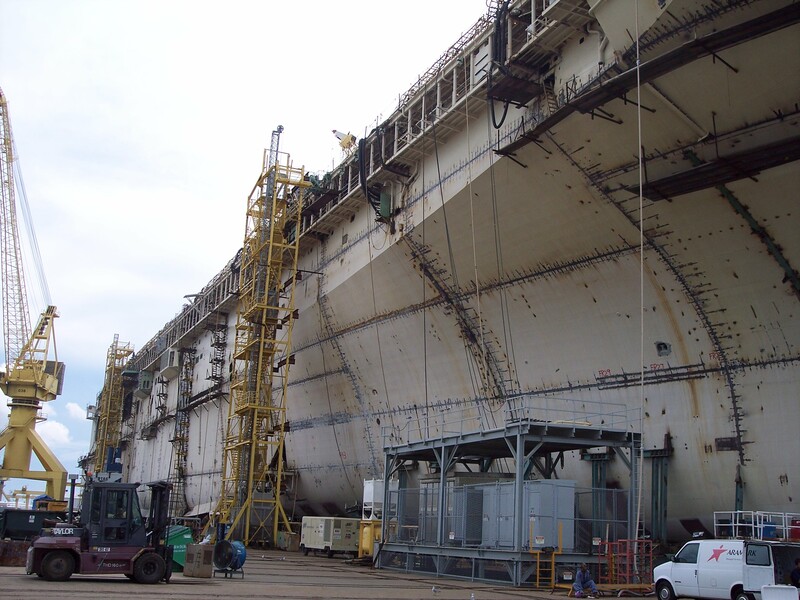 366k America (LHA-6) at Northrop Grumman Ingalls Shipbuilding Corp. Pascagoula, MS., 24 September 2011. 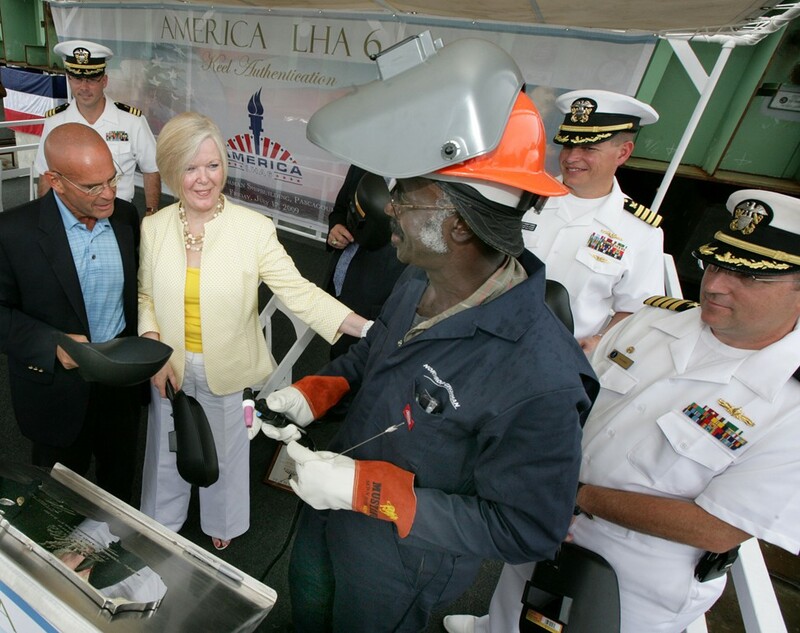 1799k America (LHA-6) launching at Northrop Grumman Ingalls Shipbuilding Corp. Pascagoula, MS., 4 June 2012. Note Arlington (LPD-24) moored in the background. 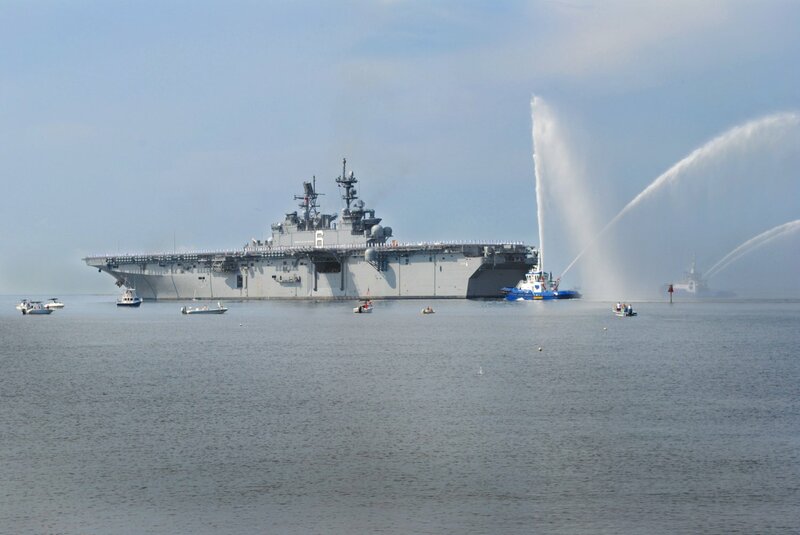 196k America (LHA-6) returns to Huntington Ingalls Shipyard after completing sea trials. During the trials, the ship's main propulsion, communications, steering, navigational and radar systems were tested for the first time at sea. 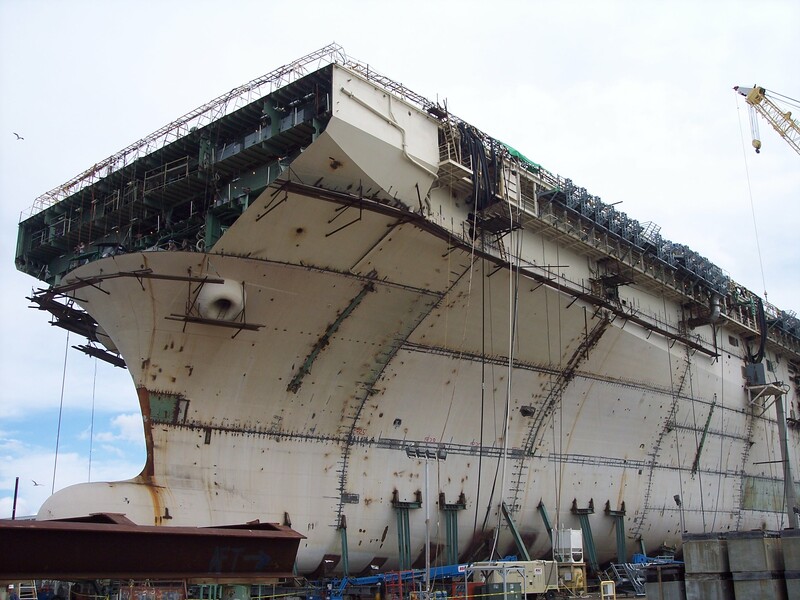 America will be the first ship of its class, replacing the Tarawa class of amphibious assault ships. 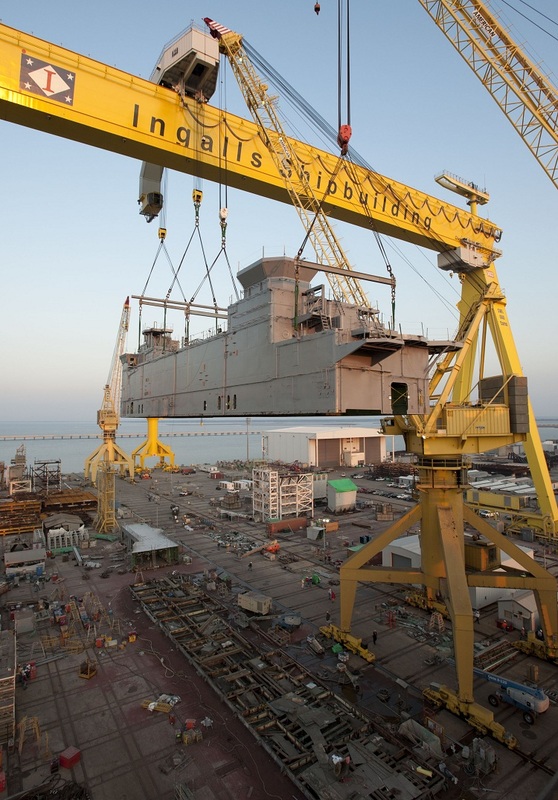 245k America (LHA-6) returns to Ingalls Shipyard from acceptance trials, where the ship's main propulsion, communications, steering, navigation and radar systems were tested. 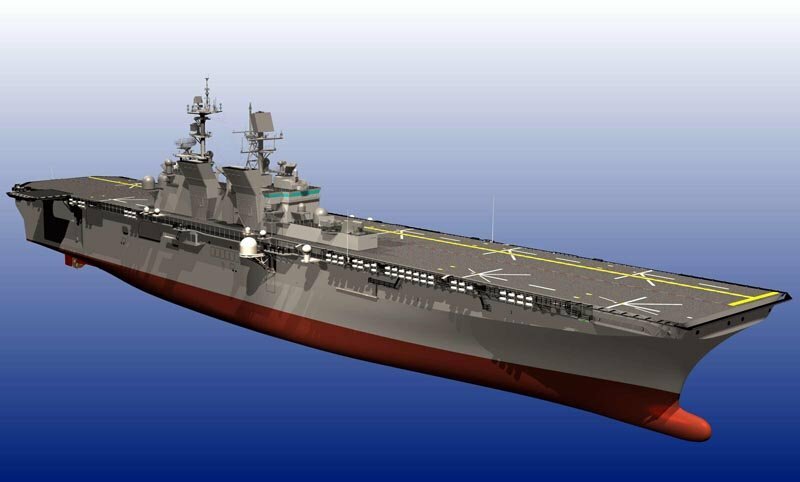 America will be the first ship of her class, replacing the Tarawa-class of amphibious assault ships. 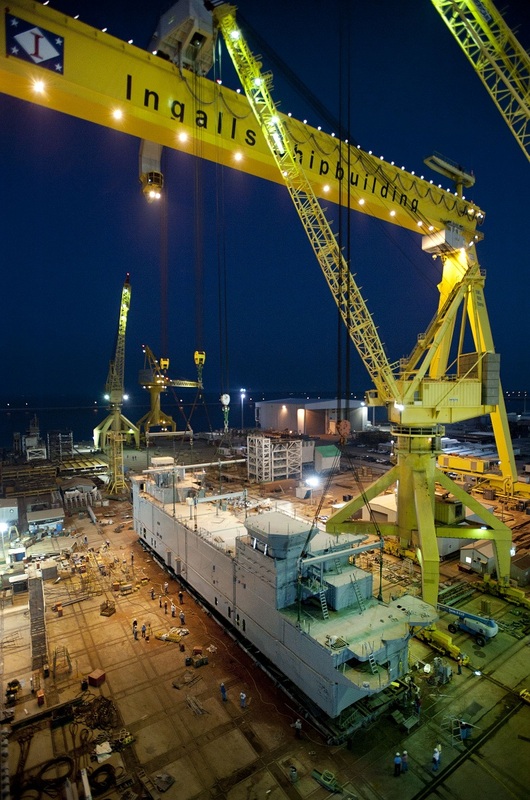 The ship was christened 20 October 2012 and is undergoing construction in Pascagoula, MS.
275k More than 900 Sailors and Marines assigned to America (LHA-6) march to the ship to take custody of it. 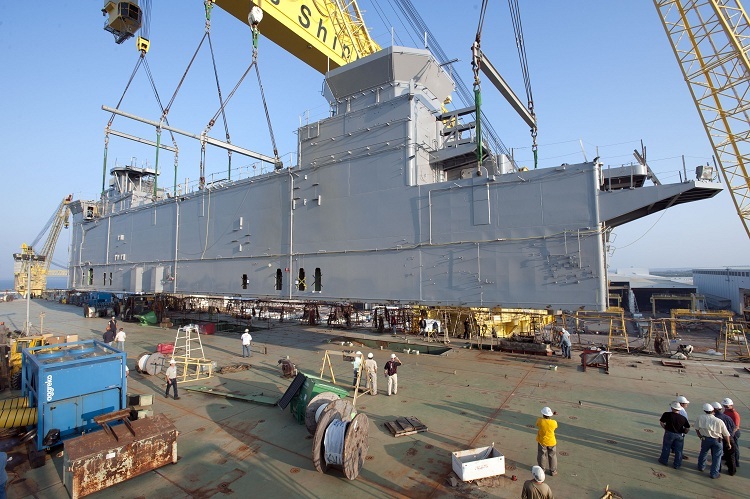 The U.S. Navy officially accepted delivery of the amphibious assault ship from Huntington Ingalls Industries during a custody transfer ceremony in Pascagoula, Miss., April 10. 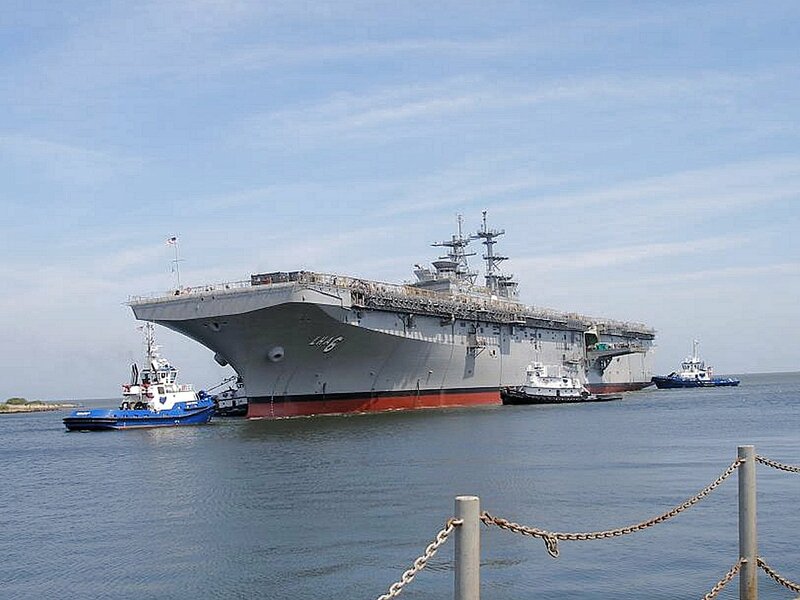 America is the first ship of its class, replacing the Tarawa-class of amphibious assault ships and is scheduled to be commissioned in October 2014 in San Francisco. 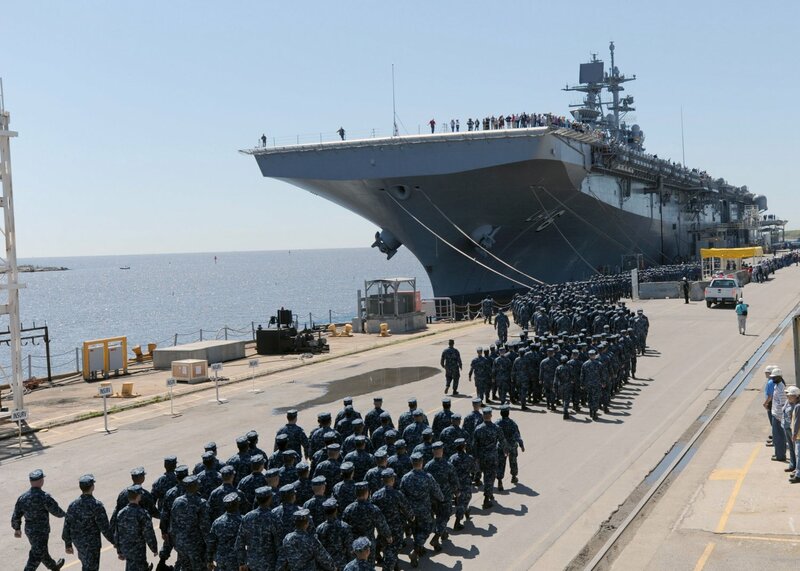 172k America (LHA-6) is saluted as she departs Huntington Ingalls Shipbuilding in Pascagoula, MS. America is scheduled to transit the US Southern Command area of responsibility on its way to San Francisco for a scheduled commissioning ceremony, 11 October 2014. 204k America (LHA-6) arrives at Naval Station Guantanamo Bay for a scheduled port visit. America is scheduled to transit the U.S. Southern Command area of responsibility on its way to San Francisco for a scheduled commissioning ceremony October 11. 212k America (LHA-6) approaches Rio De Janeiro, Brazil, for a scheduled port visit. America is traveling through the US. 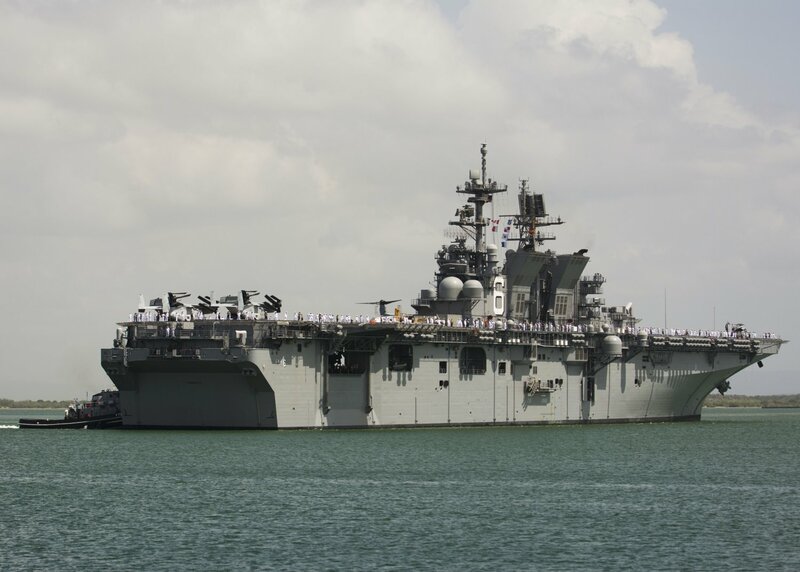 Southern Command and U.S. 4th Fleet areas of responsibility on her maiden transit, "America visits the Americas." 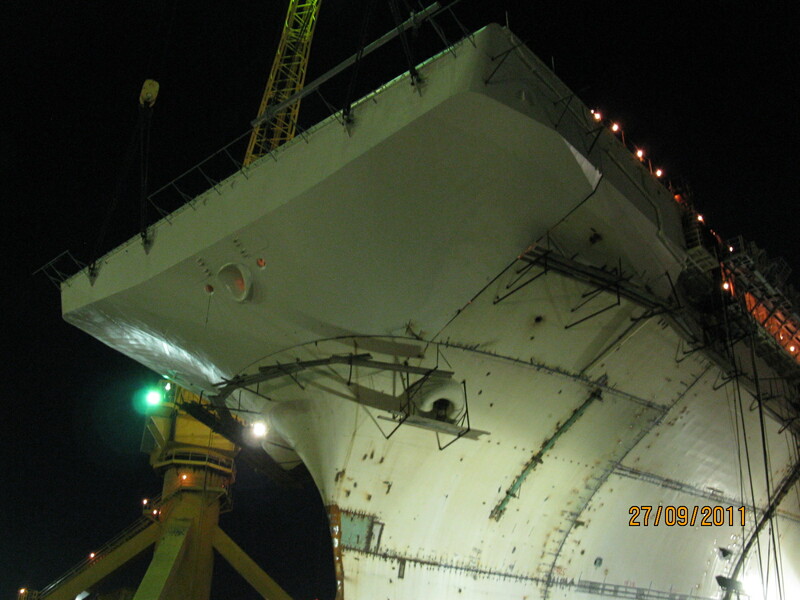 The ship is scheduled to be commissioned Oct. 11 in San Francisco. 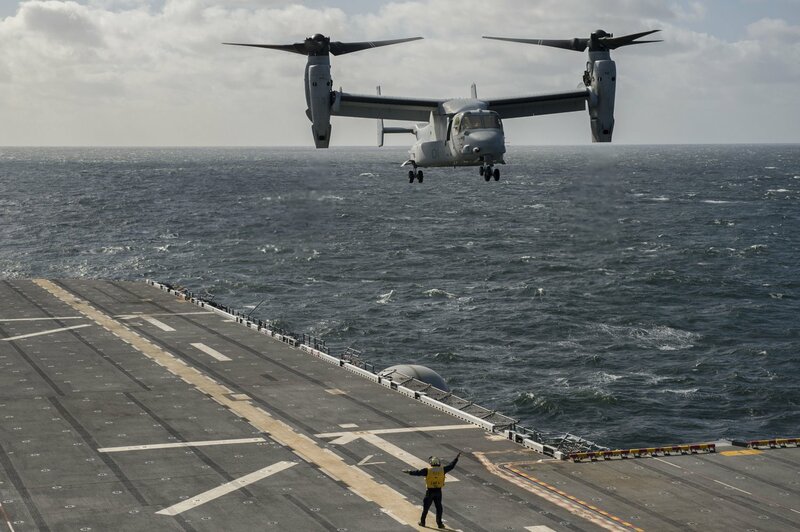 293k A tilt-rotor MV-22 Osprey assigned to the Argonauts of Marine Operational Test and Evaluation Squadron (VMX-22) transports distinguished visitors and guests from Uruguay to America (LHA-6). 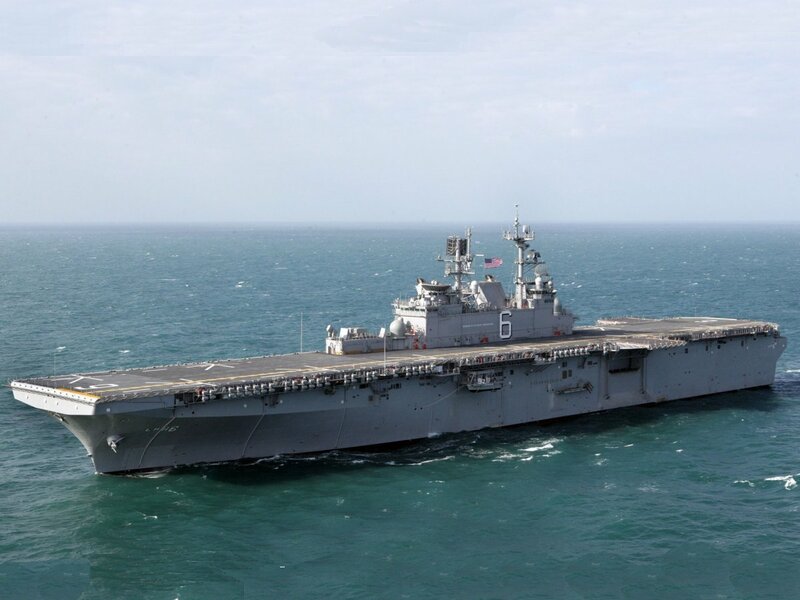 America is traveling through the U.S. Southern Command and U.S. 4th Fleet area of responsibility on her maiden transit, "America visits the Americas". 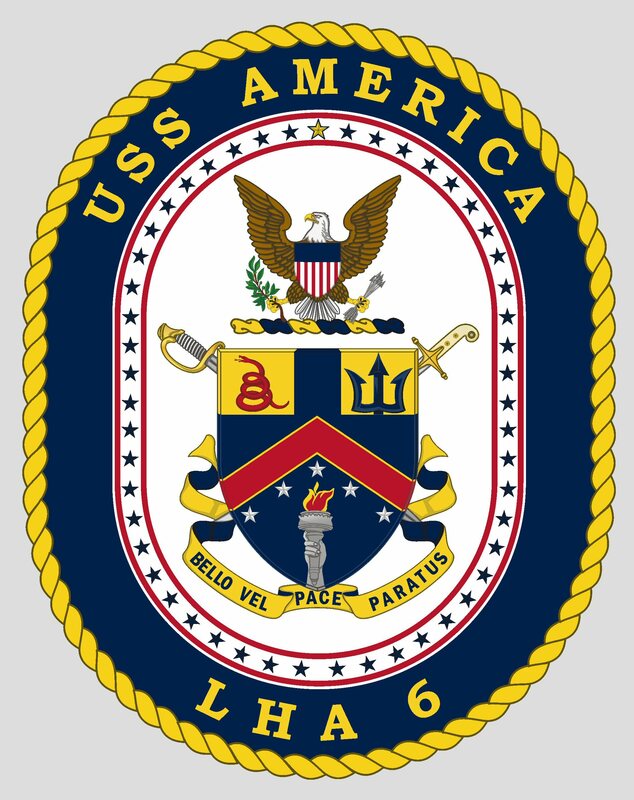 212k America (LHA-6) is under way with the Brazilian navy frigate BNS Unio (F-45). United States and Brazilian navies are participating in bilateral training exercises, officer exchanges and senior leadership engagements during the ship's port visit to Rio De Janerio, Brazil. 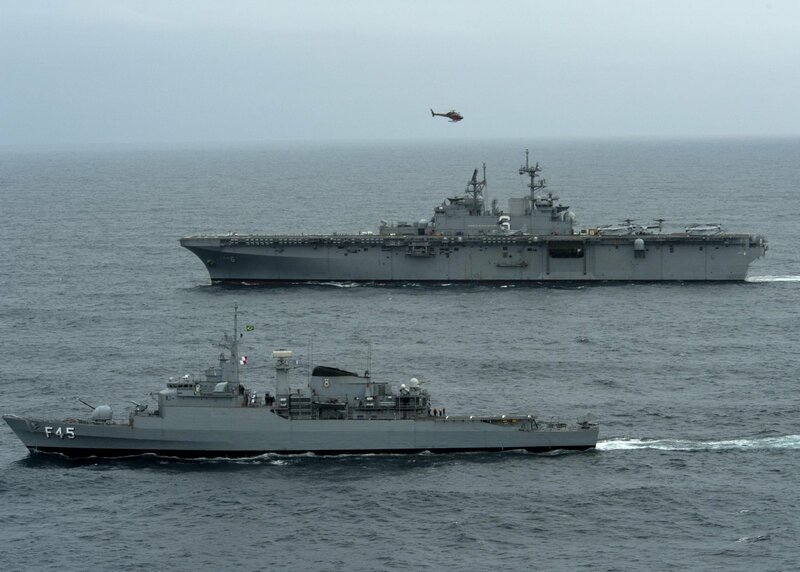 328k America (LHA-6) front, and ships from the Peruvian navy are underway in formation during a passing exercise in the Pacific Ocean. 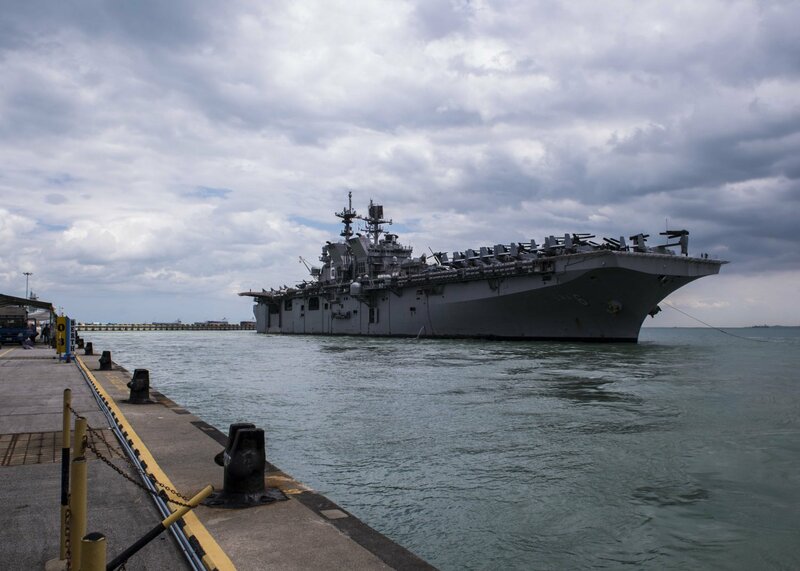 America is traveling through the U.S. Southern Command and U.S. 4th Fleet area of responsibility on its maiden transit, "America Visits the Americas." 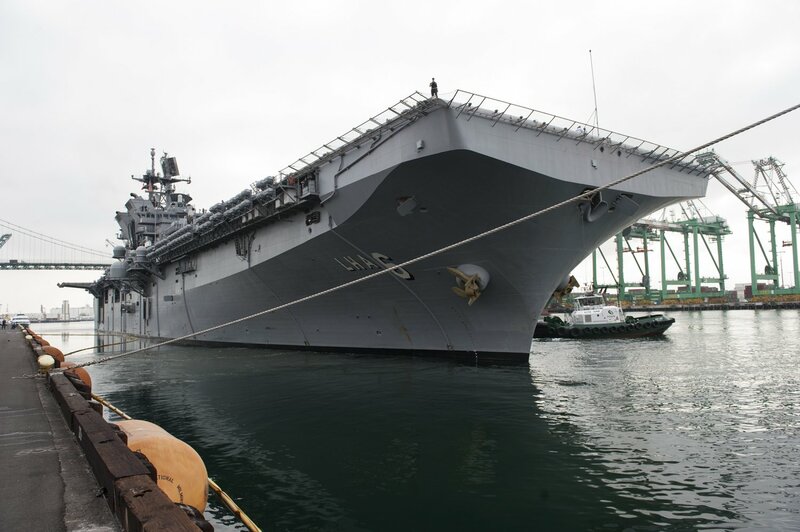 234k America (LHA-6) arrives at her new homeport of San Diego. 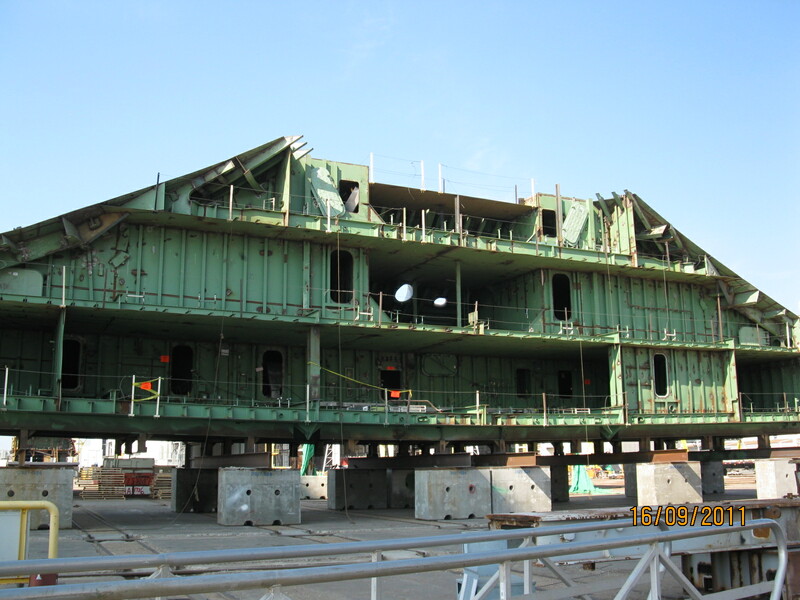 America will be commissioned at San Francisco, 11 October 2014. 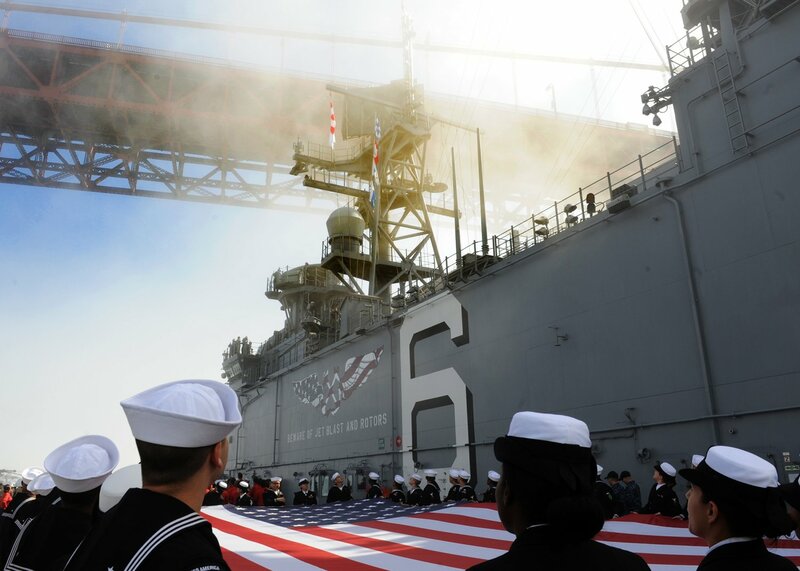 201k Sailors assigned to America (LHA-6) hold the American flag for an aerial photo as they pass under the Golden Gate Bridge during a scheduled port visit to San Francisco for the Navy's 34th annual fleet week. During the visit, the crew is scheduled to participate in a variety of community service projects throughout the Bay area. 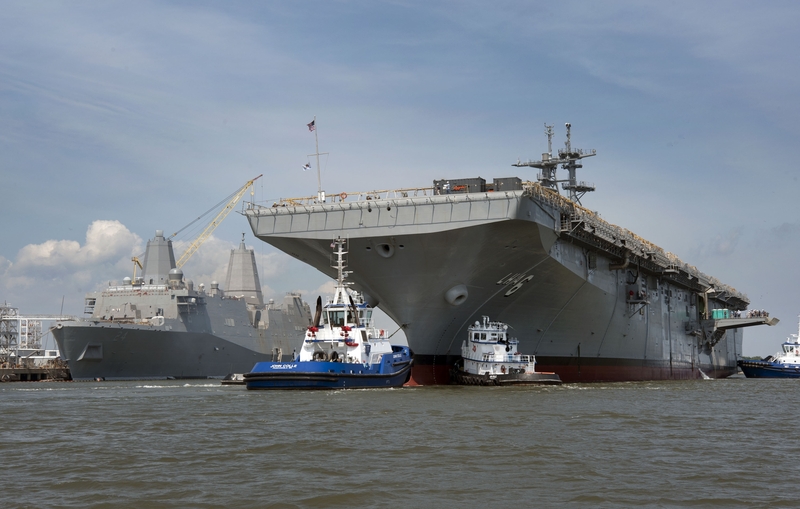 America is scheduled to be commissioned near the end of fleet week. 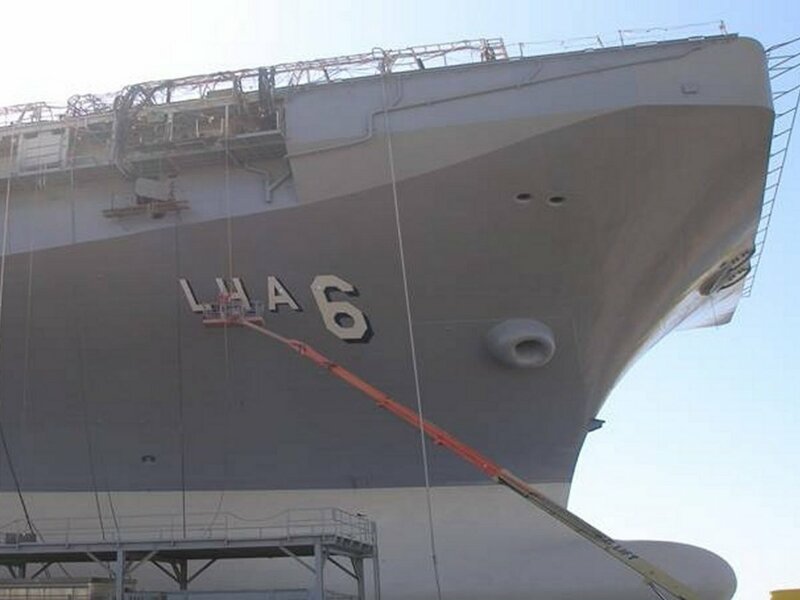 199k America (LHA-6) under way, 22 March 2016, off the coast of San Diego preparing for final contract trials after completing a ten-month maintenance period that included strengthening her deck to accommodate Marine F-35B Lighting II Joint Strike Fighters. 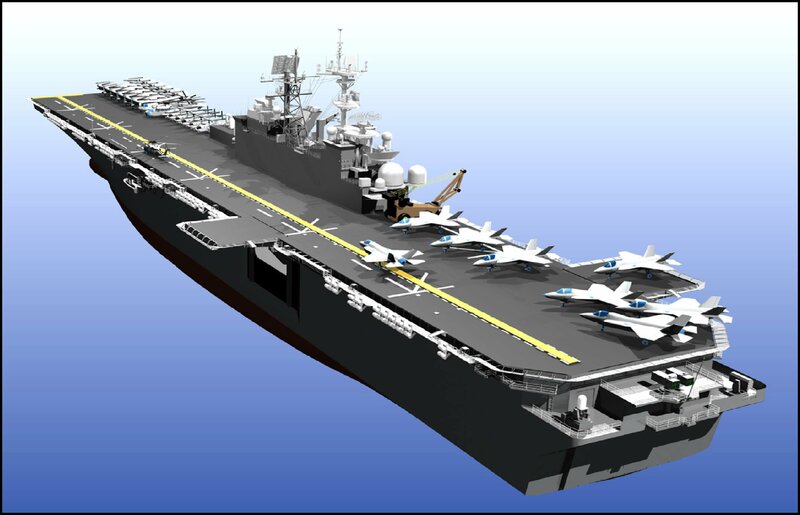 America is the first ship of her class and is optimized for Marine Corps aviation. 141k America (LHA-6) at sea under way, date and location unknown. 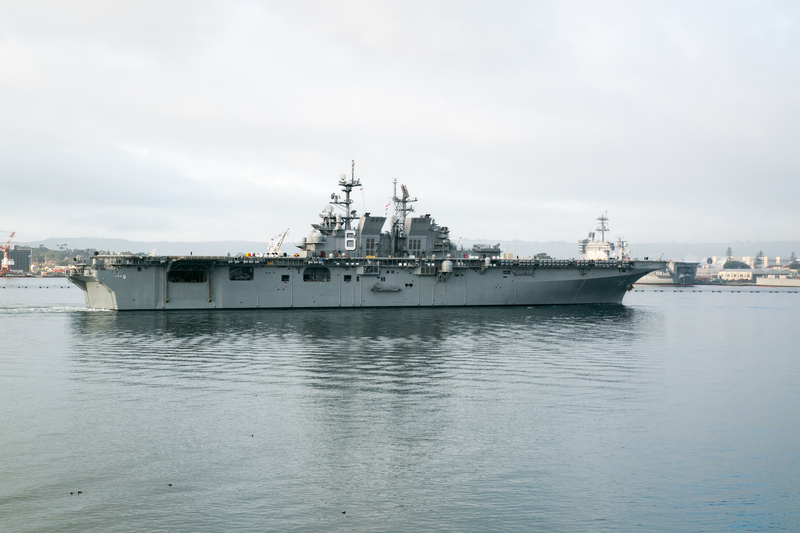 297k USS America (LHA-6) conducts flight operations off the coast of Southern California during the ship's re-certification of the flight deck after completing a 10-month Post Shakedown Availability (PSA). 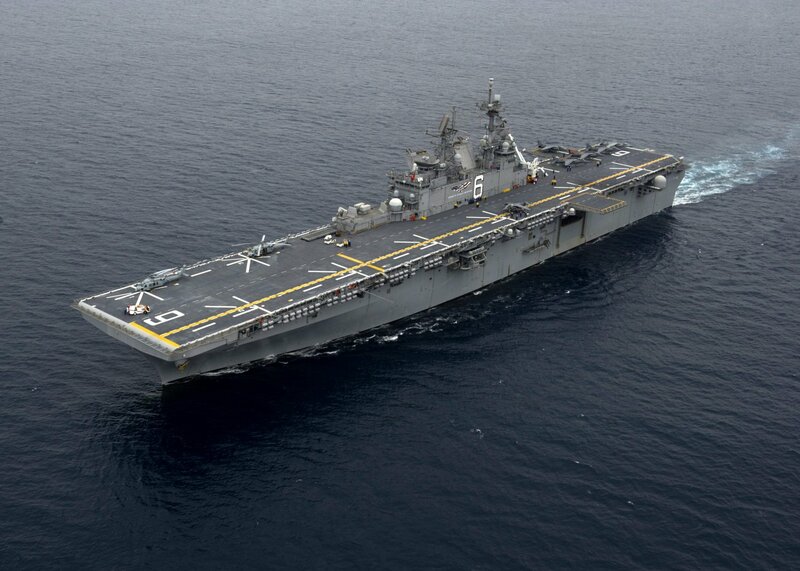 America is an aviation centric amphibious assault ship that supports small-scale contingency operations of an expeditionary strike group, to forcible entry missions in major theaters of war. 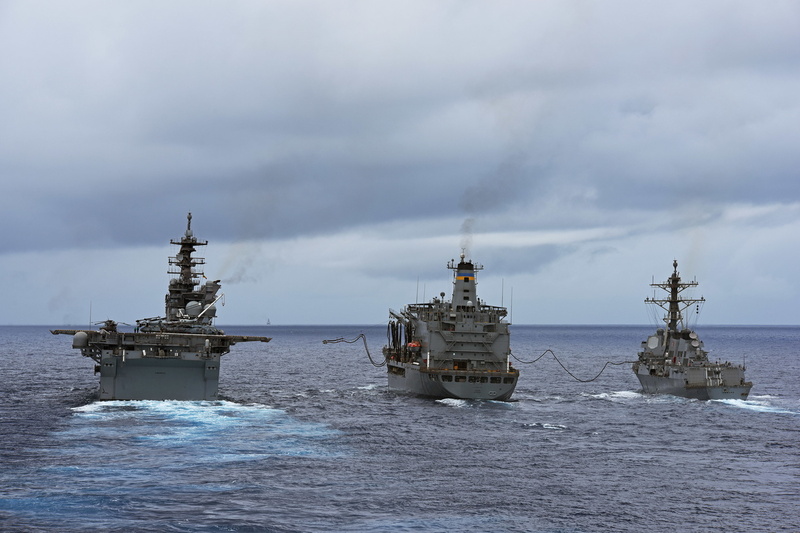 316k USS America (LHA-6), Military Sealift Command fleet replenishment oiler USNS Yukon (T-AO-202) and the Arleigh Burke-class destroyer USS Howard (DDG-83) conduct a replenishment at sea while transiting the Pacific Ocean, 25 June 2016, to participate in Rim of the Pacific 2016. 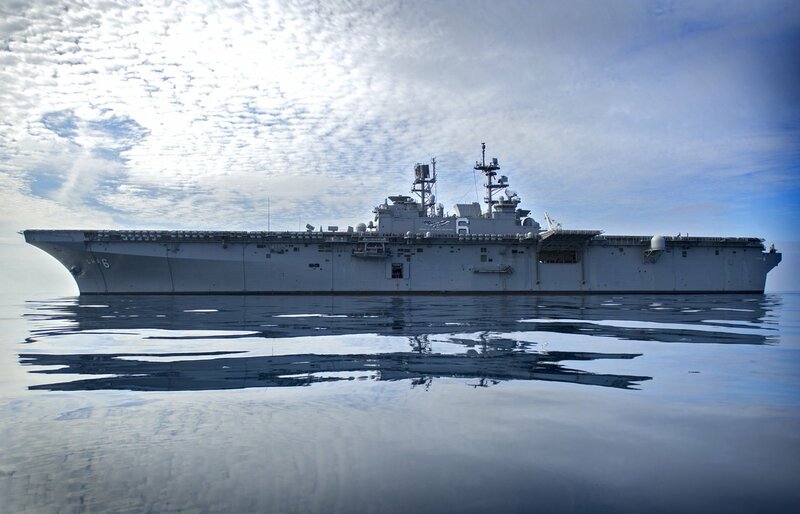 313k USS America (LHA-6) under way in the waters near the Hawaiian Islands as part of Rim of the Pacific (RIMPAC) 2016 - the world's largest multi-national maritime exercise. 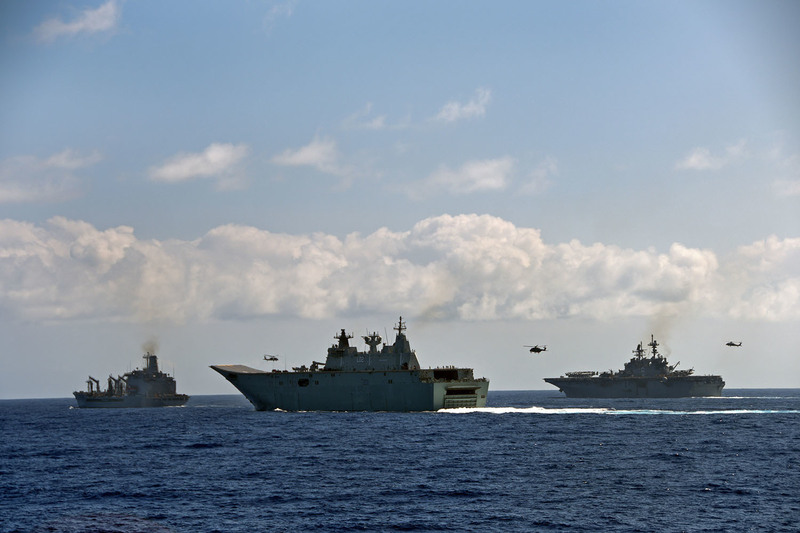 215k USNS Rappahannock (T-AO-204) the Royal Australian Navy Canberra-class amphibious ship HMAS Canberra (L02) and amphibious assault ship USS America (LHA-6) conduct an underway replenishment at Rim of the Pacific, 21 July 2016. Twenty-six nations, more than 40 ships and submarines, more than 200 aircraft and 25,000 personnel are participating in RIMPAC from June 30 to Aug. 4, in and around the Hawaiian Islands and Southern California. The world's largest international maritime exercise, RIMPAC provides a unique training opportunity that helps participants foster and sustain the cooperative relationships that are critical to ensuring the safety of sea lanes and security on the world's oceans. RIMPAC 2016 is the 25th exercise in the series that began in 1971. 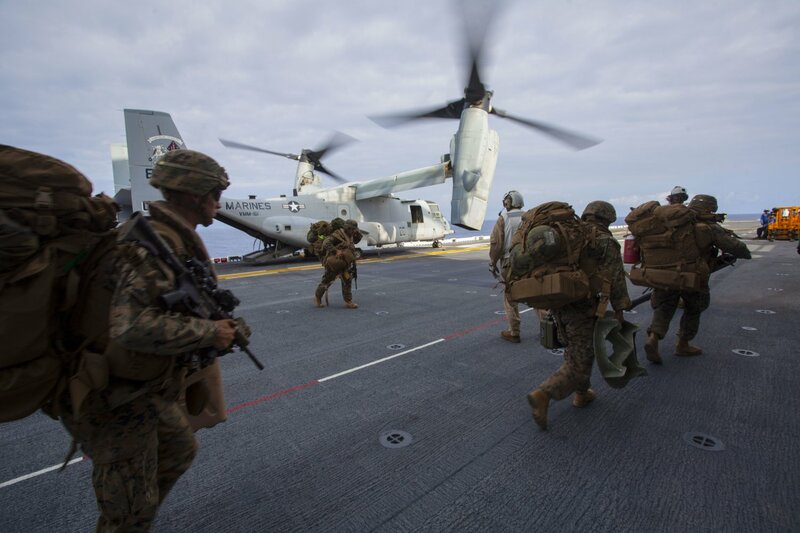 195k Marines with Fox Company, Battalion Landing Team, 2nd Battalion, 3rd Marine Regiment, run across the flight deck after landing aboard USS America, 22 July 2016. 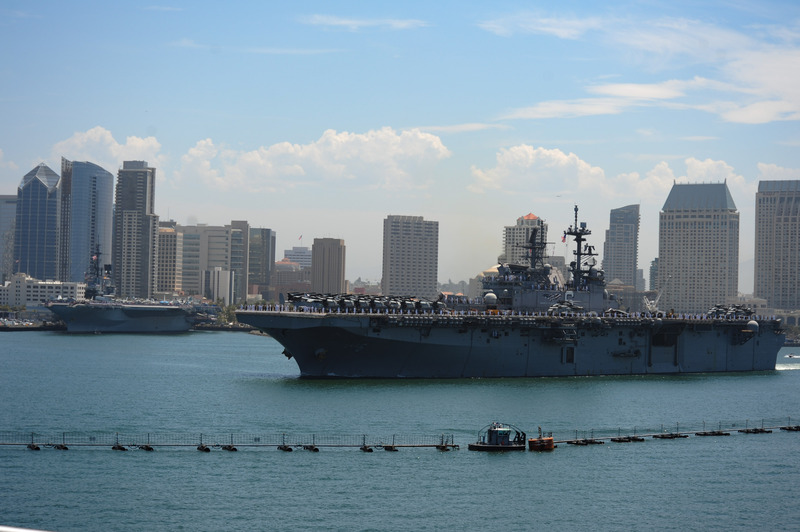 222k USS America (LHA-6) departs the Port of Los Angeles after participating in Los Angeles Fleet Week. 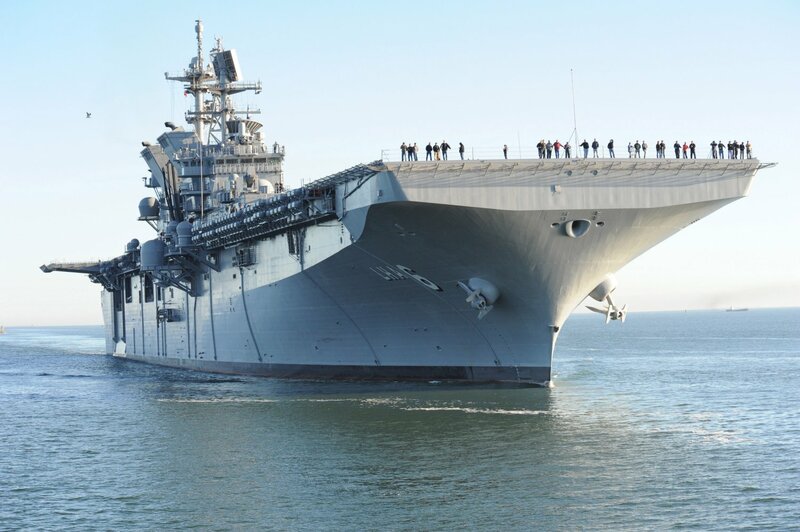 The inaugural Los Angeles Fleet Week offers the public an opportunity to tour ships, meet Sailors, Marines and members of the Coast Guard and gain better understanding of how the sea services support the national defense of the United States and freedom of the seas. 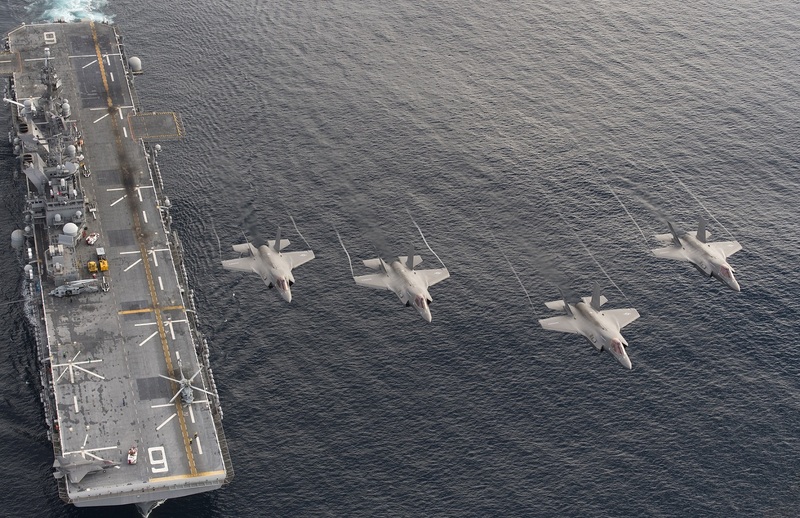 1030k Four F-35B Lightning II aircraft perform a flyover above USS America (LHA-6) during the Lightning Carrier Proof of Concept Demonstration. The F-35B will eventually replace three Marine Corps aircraft; the AV-8B Harrier, F/A-18 Hornet and the EA-6B Prowler. 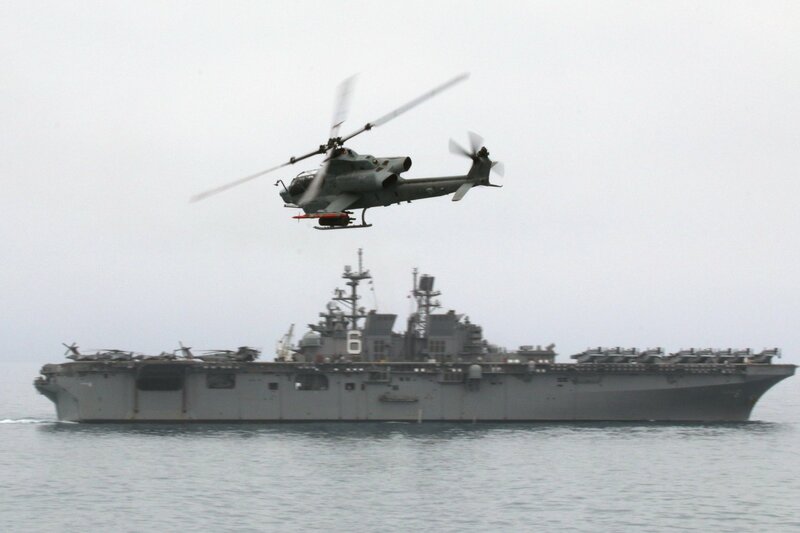 148k An AH-1Z Viper attack helicopter assigned to Marine Medium Tiltrotor Squadron (VMM) 161 (Reinforced) provides air support to the amphibious assault ship USS America (LHA-6) during a simulated straits transit. 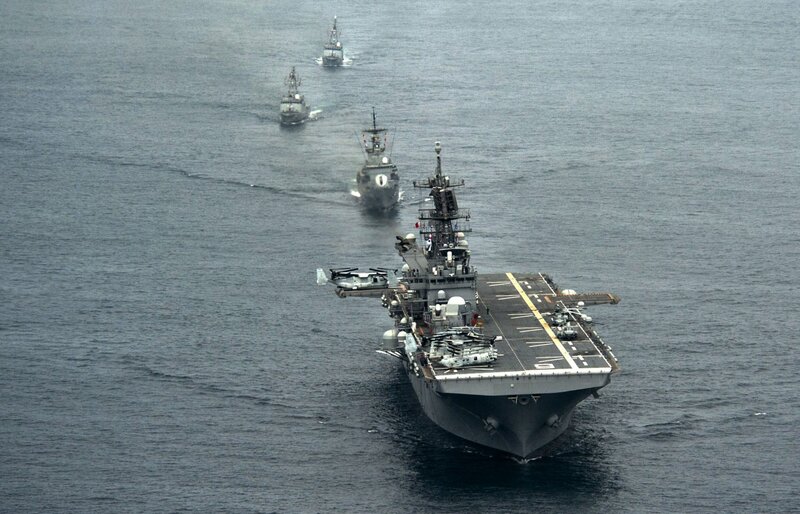 The America Amphibious Ready Group is comprised of more than 1,800 Sailors and 2,600 Marines assigned to the amphibious assault ship USS America (LHA-6), the amphibious dock landing ship USS Pearl Harbor (LSD-52), and the amphibious transport dock ship USS San Diego (LPD-22). 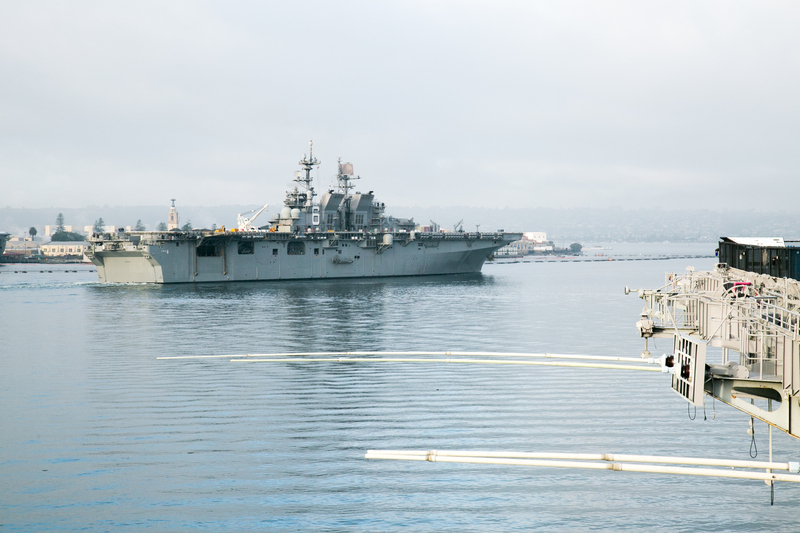 1146k USS America (LHA-6) transits San Diego Bay while departing for a scheduled deployment. 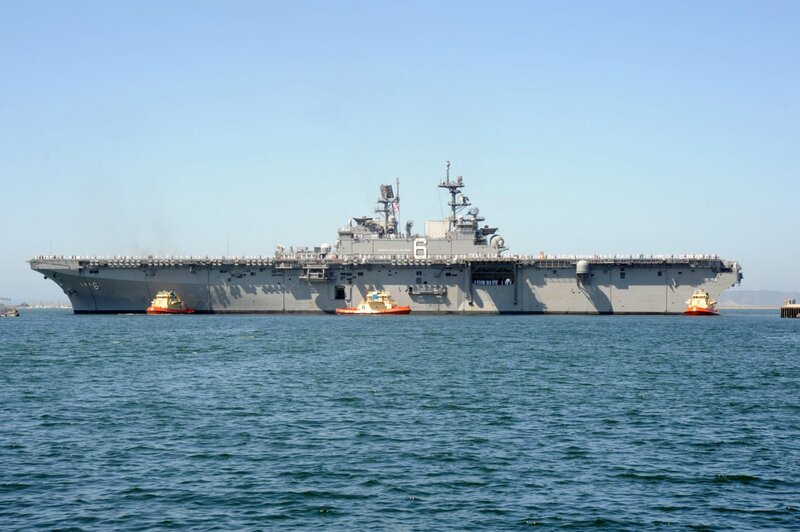 The ship and her amphibious ready group is comprised of more than 1,800 Sailors and 2,600 Marines assigned to the amphibious dock landing ship USS Pearl Harbor (LSD-52), the amphibious transport dock ship USS San Diego (LPD-22) and America. 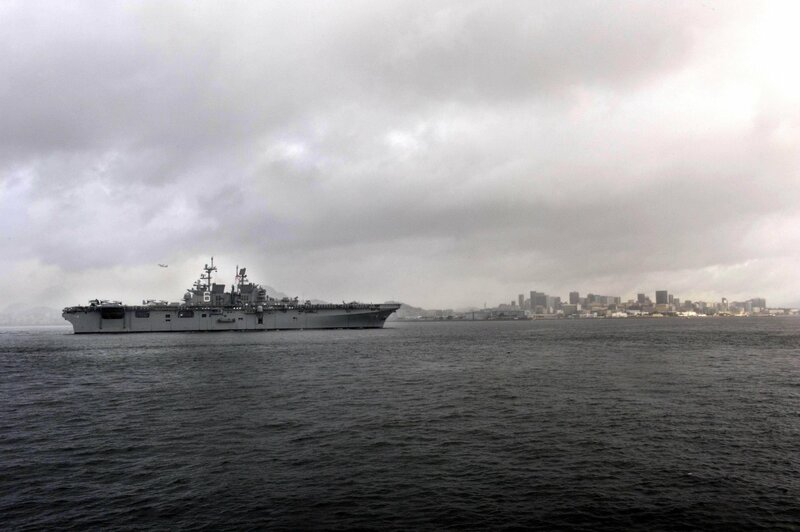 Note the skyline of downtown San Diego and the museum ship USS Midway (CV-41) in the background. 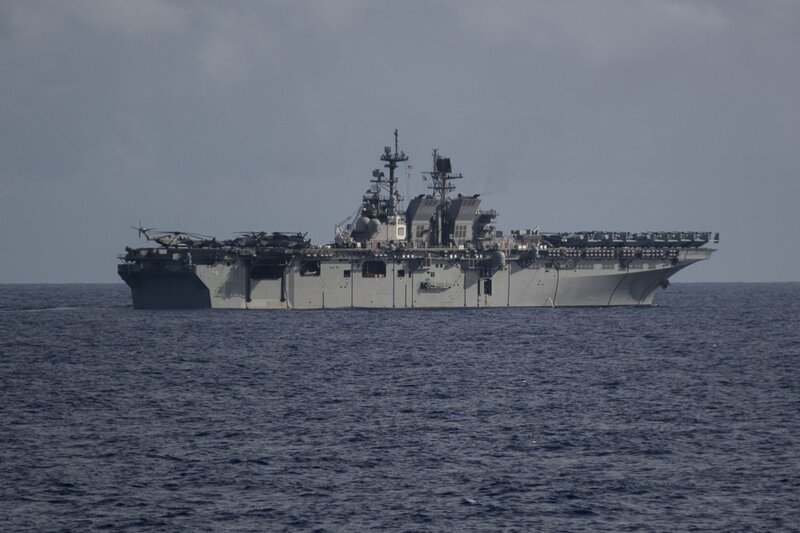 200k USS America (LHA-6) under way in the Pacific Ocean. 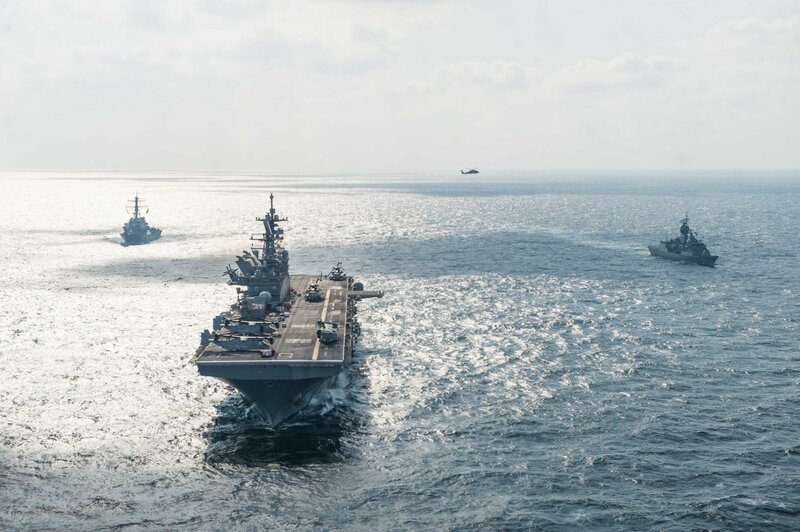 America and its amphibious ready group are operating in the Indo-Asia Pacific region to strengthen partnerships and serve as a ready-response force for any type of contingency. 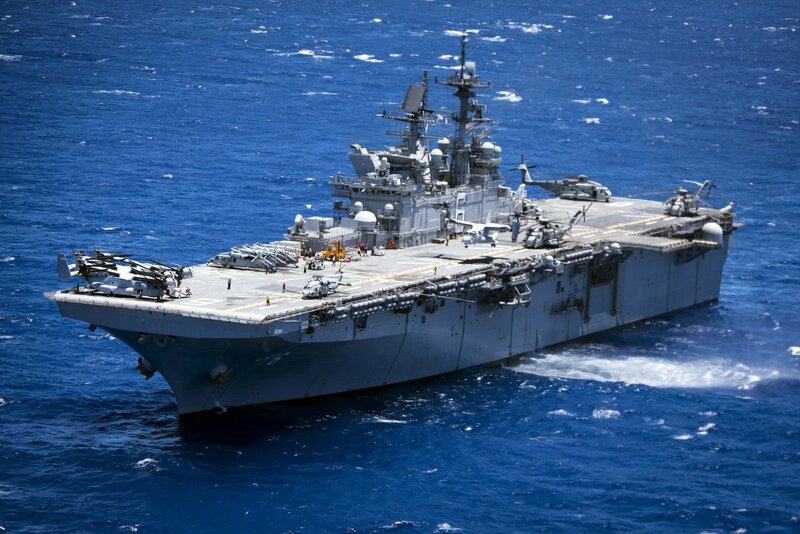 146k USS America (LHA-6) under way in the Gulf of Aden. America is the flagship for the America Amphibious Ready Group and, with the embarked 15th Marine Expeditionary Unit, is deployed to the U.S. 5th Fleet area of operations in support of maritime security operations to reassure allies and partners and preserve the freedom of navigation and the free flow of commerce in the region. 315k USS America (LHA-6) center, the Arleigh Burke-class guided-missile destroyer USS Hopper (DDG-70), left, and the Anzac-class frigate HMAS Warramunga (FFH 152) steam in formation while participating in a photo exercise in the Arabian Gulf. America is the flagship for the America Amphibious Ready Group and, with the embarked 15th Marine Expeditionary Unit, is deployed to the U.S. 5th Fleet area of operations in support of maritime security operations designed to reassure allies and partners and preserve the freedom of navigation and the free flow of commerce in the region. US Navy photo 171128-N-AC254-322 ARABIAN GULF (Nov. 28, 2017) by MC2 Alexander Ventura II U.S. Navy Inside the Navy Update, 11/30/2017. 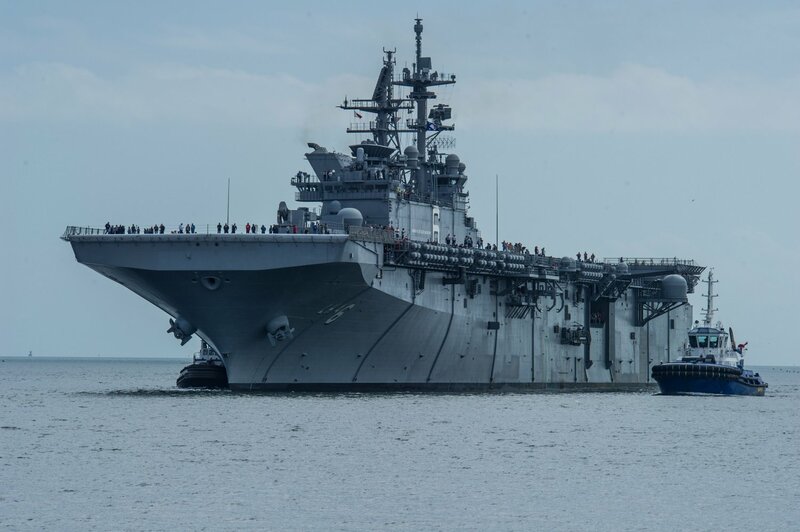 231k USS America (LHA-6) prepares to moor at RSS Singapura-Changi Naval Base, Singapore during a regularly scheduled port visit. 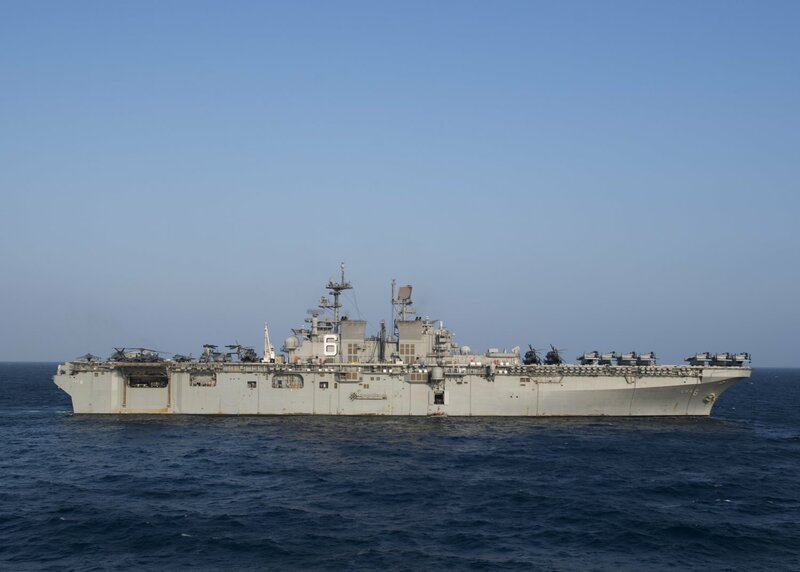 America, part of the America Amphibious Ready Group, with embarked 15th Marine Expeditionary Unit, is operating in the Indo-Asia Pacific region to strengthen partnerships and serve as a ready-response force for any type of contingency. 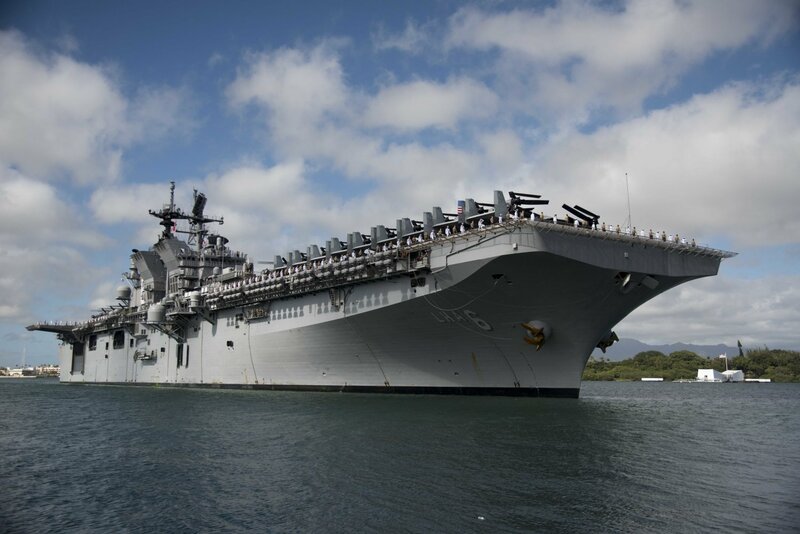 206k USS America (LHA-6) and her amphibious ready group (ARG) moored at Joint Base Pearl Harbor-Hickam 22 and 23 January 2018 for the final port call of their deployment to the Indo-Asia- Pacific, Horn of Africa, Mediterranean and Middle East.